I enjoy brewing beer, but I detest bottling it, so for my latest batch of home brew I tried something new. Instead of filling dozens of bottles of beer, I purchased a Tap-A-Draft system from Northern Brewer and filled two 6 liter plastic bottles instead. It was simple, but now I have a problem – the beer flows too freely from my fridge! The beer in question is the Pale Ale that (according to Don) I’ve been whining about not being very good. In its defense, I only gave it week to carbonate because I was so eager to try out my Tap-A-Draft. Now between the novelty of the Tap-A-Draft and my eagerness to see how much better the beer tastes with each passing day (it’s getting better BTW – I’m starting to dig it), I’ve been drinking more beer than ever. As far as I can tell, I’ve gone through three liters of beer since Sunday afternoon, which is a lot for me. There’s something about being able to walk up to the fridge with a glass and fill it with beer that’s just too easy to keep doing. Good thing for me that the Pale Ale is probably between 6% and 7% ABV, or I’d be in trouble. I’m hoping my consumption will return to normal one the novelty wears off and I get used to my new beer-pouring super powers. I’m just not sure how long that will take! Have any of you ever had this problem? ← Are You A Graphic Artist? Want to design Beer Labels? Have I Got A Deal For You! My guess is that instead of going back to normal, you will redefine normal. Welcome to your new normal. Hope you don’t get fat. “Hope you don’t get fat” Hilarious. Yeah, we have a kegerator in the office. It can be problematic, consumption definitely goes up, but so does morale! I couldn’t imagine how my liver would suffer if I had a tap at the office as well (and not the Playskool one like at home). Me too! All I’d need was one on my dashboard for total coverage. Disclaimer: Beer for the Daddy does not advocate or encourage the consumption of alcoholic beverages while operating a motor vehicle or riding in one, pertainable to local laws. Oh do I know this problem. I have never kegged my homebrew for this very reason. However over Christmas, we had a holiday party at our house. A good friend picked up a 5 gallon corny keg of Cigar City Jai Alai infused with a plum tea flavor. It was delicious. But… there was still about half the keg left after the party since there was so much OTHER great beer there. So I has a keg of freakin Jai Alai at my disposal. And I was on winter break (i work in education). Needless to say, my consumption went WAY up, to the tune of several pints more a day. Tough on the wasteline, especially during the holidays. How long do those Tap-a-Draft systems keep the beer fresh? At this rate it doesn’t matter how long it keeps it fresh – it won’t last a week! Actually, I have no idea. I think it’ll do a pretty good job of keeping the beer fresh, but I do feel like I’m “on the clock” to get it consumed before time runs out. It kinda sums up the problem. Being on tap, you actually NEED to drink it before it spoils. I guess the solution is to invite people over to drink it with you. I don’t think that’s true if you push CO2 through the keg like a homebrew keg setup, but I could be wrong. From what I have picked up the CO2 pushes the beer out and the headspace is filled with non-spoiling CO2 rather than air. I just need to make sure mine stays under pressure. Unlike a big-boy set up that uses a CO2 tank, mine uses seltzer charges that hold enough CO2 to fill the unit, but don’t provide a constant pressure that I’d get from a tank. Haha, nice. I added a second faucet to my kegerator once I started home brewing. Sure beats bottling! I will say I usually bottle some of the beer to see how it changes with age. We know it’s not going to last long on tap! Yeah, it’s a whole new world. I’m hoping I learn to control the impulse to fool around with the system and pull a beer. I’m a bit concerned. Brewed my first batch ever a few weeks ago and will be bottling it, but already procured a chest freezer for kegerator conversion. I wished i had it for this batch since if it is a failure, I don’t need to dump 40-50 bottles that took so long to fill and cap. I had a similar issue when I finished my basement. It was simply a beer fridge, but it was stocked and near the couch. I popped in Ween “Live in Chicago” on DVD and drank too many beers that sitting. Needless to say, I was a bit hung over the next day and learned of the wrath of beer convenience. You have no idea what you’re in for! If you thought having a stocked fridge was bad, wait until you add in the “play” factor of the tap. Make sure you stock up on Advil, and remember to drink plenty of water. The novelty will wear off or the wife will bear down…whichever comes first. I bottle all my beers and keep them in cellar so if I want any, I have to go down to the cellar and carry them up. Althought my fridge is stocked with beer, I try to allow myself to only consume them 4 out of 7 days a week…but whose counting? I’m usually the same way, and I’m sure once the novelty wears off I’ll go back to where I was. can I apply this same philosophy to my fiance and wearing skirts? I only see one problem here, Jim. Brewing frequency. Beer on tap = WIN. I’ve been doing at least one a month – isn’t that frequent enough, Tex? Then go with bigger batches. Man, I just bought a two keg setup and am eagerly waiting for it to show up on my doorstep. I can’t wait to be able to pull a proper pint rather than the 10oz I get out of my bottled homebrew because I have to leave 1-2oz behind so I don’t get a glass full of yeast. No doubt my consumption is going to go up. I’ll have to start running again to equalize. Maybe hook the keg up to a treadmill that pressurizes it while you run. This way you’ll have to put in a mile or two before she’ll give up any beer. I call it the HomerTrac. I also hate bottling. A lot. Shortly after I started brewing, I bought five 5 gallon kegs from ebay or amazon or somewhere and a CO2 tank. I was amazed at how fast beer could go away, especially if I invited friends over (although it was heartening that no one abandoned any beer, not even the would-be wine drinkers.) Recently, I’ve noticed that my consumption rate on the kegs has gone down, so don’t worry too much! You’ll find a balance. I think my crappy plastic bottle doesn’t qualify as a “properly sealed and CO2 charged keg” but at the rate I’m going, nothing will have time to spoil! Thank you so much. 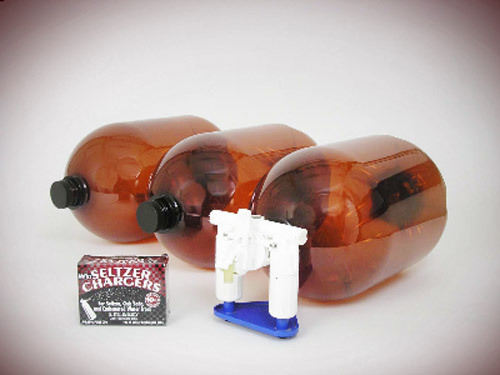 I too am a frustrated bottler and you just introduced me to the solution.